Insights allow you to have a better understanding of your organization's overall progress in the current Timeframe. Objectives - Total number of Objectives in the current Timeframe. Objectives achieved - Total number of Objectives that have at least 70% progress in the current Timeframe. Objectives at risk - Total number of Objectives that have less than 20% progress in the current Timeframe. Hover over the warning sign to review the list of Objectives at risk. Missing alignment - Total number of Objectives, excluding Company Objectives that are not aligned. Hover over the warning sign to see the list of Objectives that are unaligned. Key Results - Total number of Key Results in the current Timeframe. Key Results at risk - Percentage of Key Results under 20% progress in the current Timeframe. Actions - Total number of actions in the current Timeframe. Actions completed - Total number of actions in the current timeframe with 100% progress. This data takes the entire Organization into consideration. Company progress shows the average progress of all the company’s objectives in the current Timeframe. Adding quality OKRs can sometimes get a bit tricky, it’s a process mastered over time. We’ve included a quality checker that will help you understand if you have the necessary elements of a good OKR. All Objectives have at least one Action. 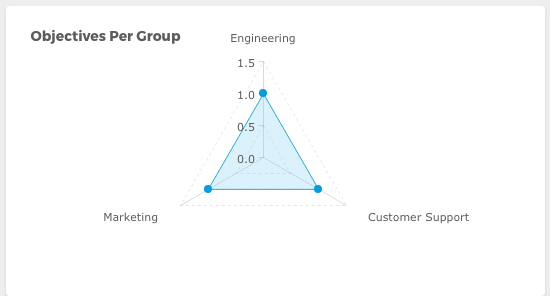 It’s important to understand where each one of the Teams that make up for your Organization stand, so we’ve added a graph that will allow you to see all existing groups and the total number of Objectives they own. 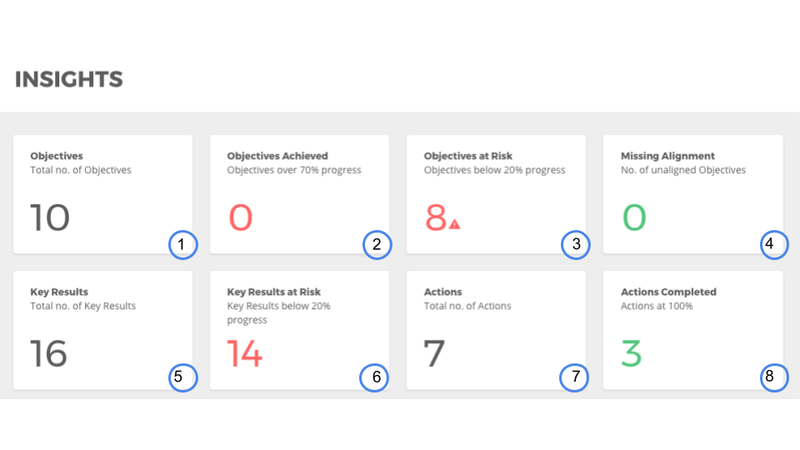 Under Execution Score, you will be able to track if your Users are setting Actions throughout your Organization. 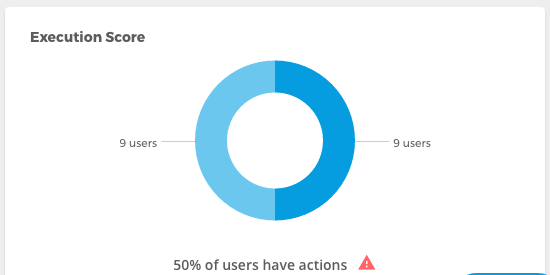 The Light blue section shows the amount of users that are contributing with at least one Action in the current Timeframe. The Dark blue section shows the amount of users that don’t own or contribute on any Actions in the current Timeframe. to see the list of users that don’t have any Actions. You can easily click on any of the users to see their Profile.